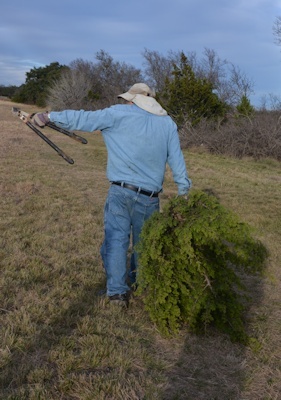 When we bought the land, it had hundreds of invasive small (2-5 feet tall) Ashe junipers what had been open grassland. R- cut nearly all of them out. Ashe juniper is not a horrible bad trash tree, utterly useless, as some claim, but like any plant it will spread out of its normal habitat if what should be there is destroyed. 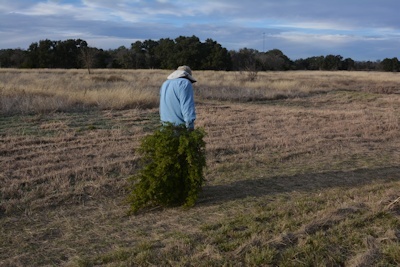 In this case, severe overgrazing had taken the native mid- and tall-grasses down to the nubs, and the juniper moved in. Some juniper is of use--as windbreak and as food and habitat source for some wildlife. I've seen flights of monarchs on migration sheltering in it when a wet norther stops them; various birds and small mammals eat the juniper berries, other birds strip the older trees' bark to use in building nests, etc. But too much juniper is too much, so we thin and cull and...near Christmas...go looking for one that's not ball-shaped but pointier for a Christmas tree. At this age, they have skinny trunks, so the big lopping shears took it off at the ground. 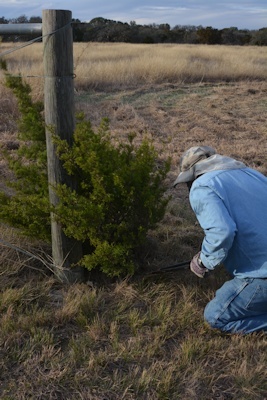 Removing some of the young Ashe junipers also fits in with our wildlife management program. I've taken out a lot of them with lopping shears myself, over on the west end where R- has chain-sawed a number of bigger ones to open up the grassy area there. We don't remove them in fencerows (except to repair/build fence when it's necessary) or in the woods areas. I'm seriously thinking of plaster of Paris or concrete in an old wormer bucket. Tree's dead, essentially, and it only needs to be "up" a few days, starting this late. If we can give it a heavy, wide base, it could just sit on the floor from, say, tomorrow until Saturday and then be tossed in the gully system (where we put the trees, as erosion control.) But R-'s gone to a store to try to find something less drastic. You could always just nail two wood slats to the bottom. It dries out quicker, but you have a fresh tree that should be good for a while. We have collared doves near the house. They're an invasive species, but I quite like them. They're fun to have around. We could if we hadn't used the wood slats we used to have for something else...oh. Wait. We have that old disintegrating wood chair...wonder if that would hold it. Thanks for the reminder. Drop down two posts to "Where I ride". That big round green thing in the first picture? 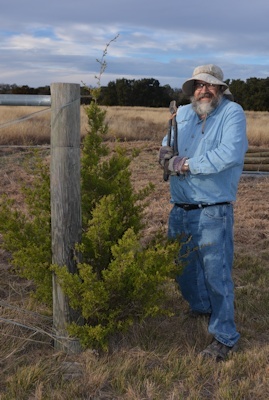 Is a mature Ashe juniper. White-winged doves strip off the peeling bark and use it for their nests. Turkeys nest under them sometimes (and scuffle in the dust under them for dust-baths), and during migration they're cover for dozens of species of small birds, protecting them from aerial predators and many ground-based ones. The insides of old junipers are prickly. 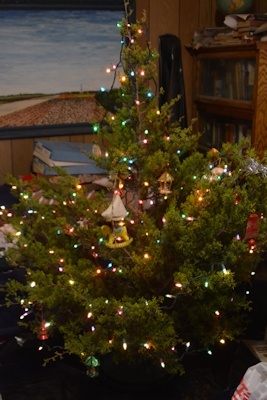 I love local "cedars" for Christmas trees, and have had one often. Unfortunately, last year when I had managed to get one up and decorated that almost reached the 11-foot Victorian ceiling, it developed that my good friend who is occupying our "spare" house, and his son, and my sister-in-law are all extremely sensitive to them, and got very sick. This was a male specimen with pollen. Perhaps I will look for a small female next year and see if it is tolerable. Otherwise, I guess no more cedars. It's too late for this year's tree, but what my father, and now I, have always done is fill a five gallon bucket with gravel, insert tree stump as far down as you can get it, (trimming off lower limbs as necessary) and fill bucket with water. When I was a child my father used to drill out a hole in a two by six to fit the stump through and then chisel the ends to fit the curve of the bucket, but if you don't have small children or large pets this is not necessary. Then fasten a white sheet around the bucket to be snow. Top up the water once a week. I usually cut a tree not long after Thanksgiving, and I keep it up until after my birthday at the end of January, which is when it is just barely beginning to dry out enough to shed. I believe, but am not certain, that the cedars we have around here are Juniperus canadensis.